- It supports mobile phone with width from 2.17"(5.5cm) ~ 3.35"(8.5cm). 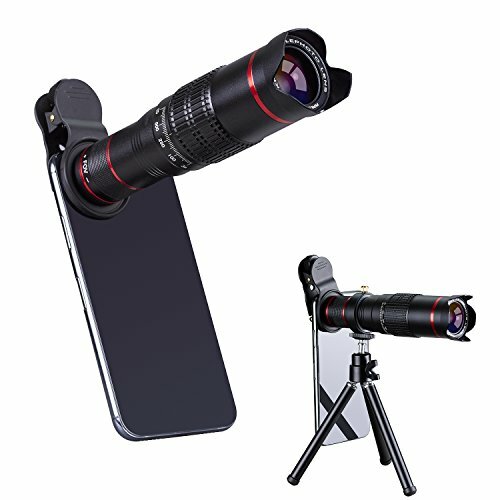 Camera Lens kit--HuoXing 22 x Phone Telephoto Lens is The Upgrade Version of Mobile Phone Lens, There are Two Focusing Areas, in Which The Eye Wheel Can Avoid The Appearance of a Black Circle in The Picture of The Phone, and The Picture is Not Clear. The New Design is Applicable to All Kinds of Mobile Phones, Such as iPhoneX/8/7/6/ Samsung Galaxy S5/S6/S7/S8, SONY, Huawei, LG, iPad, etc. Tripod/Universal clip--Our accessories tripod and universal clamps are upgraded--All made of aluminum alloy are not plastic, so the quality is much better than plastic. The Tripod Lengthened From Two to Three . Up to 11 Inches, with Greater Stability and maneuverability. In addition, the universal clip USES silicone stickers to protect mobile phones and optimizes the shape of the silicone so that dual-camera phones can also be used perfectly. Package--An upgraded version of the packaging, a very portable box,You can take it with you when traveling, watching competitions, watching animals, going to concerts and other outdoor activities.You can enjoy the high-quality photos and beautiful moments brought to you by the 22x lens. Appearance--The metallic appearance will make the hand felling very good, and it accords with the ergonomics. People can use it more comfortable. If you have any questions about this product by HXGD, contact us by completing and submitting the form below. If you are looking for a specif part number, please include it with your message.